A biological granular formulation for enhancing root growth in density and spread: Enhance nutrients and water uptake: Building resistance against insects, pests and diseases: Enabling plants to with stand stress due to temperature and physiological changes: Improved quality and yields. 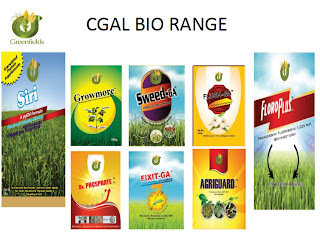 SWEED GA is a preparation from seas weed extract which enters directly in the plant system: It induces resistance against pests and diseases: Increase nutrients up take from soil by triggering plants system: Promote extensive branching with lush green foliage: Improve flowering density and size of the fruits: Improve quality and assured increase yield. AGRICGUARD GA is a preparation from fungi strain (Trichoderma spp.) which has antagonistic effect on other fungi and bacteria causing soil and air borne diseases: It controls root rot, damping off and wilt effectively by producing antibiotics and cell wall lysine enzymes. A biological water soluble formulation to help plant improves growth by producing growth promoter which is toxins to diseases causing bacteria and fungi. A biological water soluble formulation which solubilizes the insoluble phosphorus: It makes fixed phosphorus available which in turns reduces the quantity of fertilizer required. Soil Emperor (Organic Fertilizer): Excellent soil improver compost with uncountable benefits, nutrients and microbes for healthy crops production. Our organic fertilizer is powerful compost from both animal and plant source. NPK is 15:10:10 Suitable for vegetables. Neem Oil: A powerful 100% organic insecticides that effectively controls the attack of over 600 pests on farm crops. When combined with palm kernel oil (Adi dudu), Neem oil becomes very powerful. Application: 1 table spoon to one liter of water. Use Native Black Soap (NBS) as emulsifier. Neem is applied as folia spray. Garlic/Ginger Extract: Powerful antibiotic, pesticides and fungicides used in the control of diseases on the farm. Made from 100 percent organic product also consists of alligator pepper, this product combines well with neem oil as insecticides. It also contains sulfur as micro element supplement. Beneficiary Microbes: Packed full of beneficiary microbes that will handle soil borne diseases like bacteria wilt. This is the fulcrum and foundation of all our organic products. This product enhances nutrients delivery to plants as these beneficiary microbes occupies spaces that dangerous bacteria, fungi and viruses would have occupied. The micro organism will also unlock nutrients hidden in spent soil for benefits of the plants. Plant Buffet: Plant Buffet is an excellent liquid fertilizer formulated using fish hydrolysis, blood meal and plant source fermentation. If you desire lush green leaves with powerful roots and stem for your plants then Plant Buffet is for you. It is packed with Nitrogen, Phosphorous and Potassium. It is also rich in calcium, sulfur, magnesium, sodium, Iron, copper, zinc, aluminum, chromium and Barium, all from natural sources. Harvest Plus: Harvest plus is to ensure bumper harvest. This product is packed full of calcium, phosphorous, potassium and other micro element essential for fruits production for plants. All materials used for this product are purely from organic source. Organic Herbicides: A powerful non-selective herbicides made from Mint oil. Used also to sterilize the soil. Application: Use as folia spray to suppress weeds. 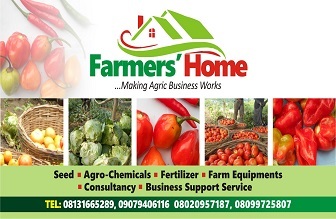 Farmers Fertilizer: An excellent imported fertilizer in conjunction with All Farmers Association of Nigeria. This product is made from Seaweeds and kelps plus other micro nutrients from natural source. A liter of this concentrate will fertilize an hectare. 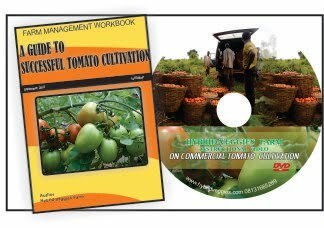 Perfect for all crops from plantain to vegetables, fruits to cereal. Application: comes with a manual with specific application procedure for all kinds of plants. Call 09090312798 or Whatapp us on 08131665289 to know more and order for yours.